The Watkins Family Hour at Largo: Who Says Los Angeles Doesn’t Have Seasons? 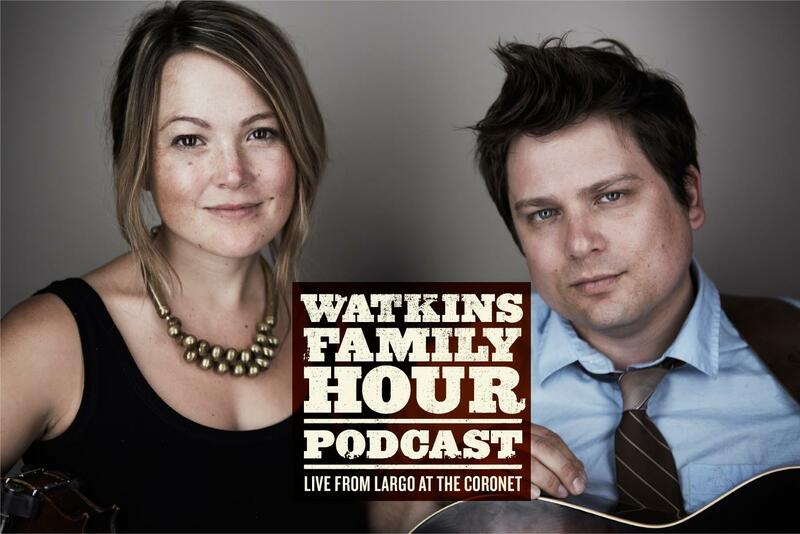 For 13 years, Sean and Sara Watkins, along with their extended family of friends, have come together to create one of the most exceptional experiences in Los Angeles, The Watkins Family Hour. In addition to their music, what makes this gathering so special is the humanity, connection, joy, and presence The Watkins Family exudes. The spirit in the room feels festive and light. It’s a gathering of good friends, who’ve come together to celebrate and share stories, songs and laughter. The dynamic interaction between those on stage is shared with all in attendance. The musicians have a long history with each other, but they make sure to let the audience in on their inside jokes. With their presence and openness, The Watkins Family unites us all. Their music carries a similar inclusive, dynamic, and evolving energy. Thanks to the tone The Watkins Family sets and Largo‘s no-cell-phone policy, it is a completely immersive experience. You can get lost in the sound, hear how each note plays off the other, and the way the instruments and voices work together, each elevating the other. Rather than simply play their part, the musicians listen to and accompany each other. It is a live music experience in the purest sense. Created in front of you, the songs feel different each time they’re played. The Watkins Family Hour is a monthly residency that has spanned more than a decade, yet the show is still refreshing, unique, and anticipation for the next one never wanes. The dynamic atmosphere is balanced with a sense of history and tradition. Whether you’re attending your first Watkins Family Hour show or your thirty-first, it feels as though you’ve been there since the beginning. The Watkins Family transports you to another time and place, where all there is to do is enjoy music and our time together. There are no computers, fog machines, nor fancy lighting rigs. You may feel like you’ve been invited to a family gathering at one of their homes, especially when Sean and Sara sing while standing beneath a homemade snow machine, getting doused by white flakes. Last night, The Watkins Family reminded us not to take things too seriously and to embrace and express our childlike spirit. With the snow machine and humorous elves, they also gave us the gift of another inside joke and “you had to be there” moment. There’s music, comedy, and last night, there was snow. You can’t Auto-Tune this and it won’t translate in virtual reality. The Watkins take you on a journey which, like life, is ever-changing and more fun to navigate with music, a sense of humor, and surrounded by family and good friends. This entry was posted in LA, Largo, Watkins Family Hour and tagged David Garza, Jackson Browne, Largo, live music, music, Sara Watkins, Sean Watkins, The Watkins Family Hour. “If you were here ten years ago, you were probably eating honey chicken” may sound like an odd intro, but it was the perfect statement to kick off The Watkins Family Hour 10-Year Anniversary show at Largo. Those of us who have been attending the Watkins Family shows for ten years (or more) remember the honey chicken tradition well. The best way to ensure getting into a show at the old Largo location on Fairfax was to reserve a table. There was a $15 per person food minimum and the honey chicken was a crowd favorite. The process seems so analog now. You’d dial into an answering machine and leave a message with your name, phone number, and the show you’d like to see. You then waited by the phone for the next two to three days, hoping you weren’t too late, that there were still tables available. If you were lucky, you’d receive a confirmation call from Largo to lock in your reservation. Thanks to technology, the process has since been updated, but I still feel that lucky each time I experience a show at Largo. With the venue’s move from Fairfax to La Cienega, went the kitchen, the honey chicken, and the sound of knives and forks clanking against plates during the show. It was all part of the experience and core to the foundation of Largo that remains today – a place like no other. As I’ve written previously, The Watkins Family Hour is one of my favorite ways to spend a night in Los Angeles. I was in Africa during much of December, without phone or internet, gazing into the eyes of lions, giraffes, elephants, rhinos, and leopards. The first thing I did when I returned home – prior to unpacking, calling friends and family, and eating – was check Largo’s website for a January Watkins show. The January 11th 10-year anniversary show was indeed listed and, like the old days, I was grateful it wasn’t too late to get a ticket. The collaborative and uplifting spirt of The Watkins Family Hour is undeniable. Each show feels like a celebration of music and friendship. In this case, the friendships were further highlighted, as the Watkins reminisced about the past 10 years, sharing stories each time a special guest took the stage. After Fiona Apple joined The Watkins for an extraordinary performance of “You’re The One I Love”, she and Sara laughed, remembering the intensity of recording the song. They explained that they stared into each other’s eyes the entire time they sang the song, take after take. “Then… I don’t know what happened. It was so intense!” Fiona exclaimed. “I think we eventually erupted in laughter,” Sara responded. “Yeah, because it was so intense – it was funny,” Fiona added. “It’s a funny song,” Sara joked. The Watkins Family Hour is essentially a show down between the songs and the moments between songs. Hearing the music, watching the band – each member lost in his own world, yet connected and communicating with the others – is magical. I find myself filled with gratitude, so happy to be there, lost in time. Then, between songs, another kind of magic happens. The spontaneous conversations, the humor that’s delivered as if you’re in on the inside joke, the stories shared. . . No longer are you in a theatre. You’ve been transported to the Watkins’ living room. Tonight, we also experienced magic in the traditional sense of the word. Comedian and magician, Derek Hughes, made a guest appearance and “a commitment to our astonishment” as he performed numerous mind-blowing card tricks. I’m happy I drank a bottle of sake prior to this show or my mind would have been reeling, trying to figure out the tricks. Instead, I was simultaneously laughing and “astonished”, non-stop, throughout the show. When Glen Phillips joined The Watkins on stage, Sean told a story about the first time he and Glen connected. Sean wrote Glen a note and sent him some songs. Glen finished the story, explaining how – upon hearing their songs – he invited Sean and Sara to play with him at Largo. As he spoke, Glen appeared to be overcome with awe. Everyone on stage looked like they couldn’t believe they were playing with each of the others, as if it were all a dream. Fiona joined Sara and Sean for a few more songs, allowing us to witness the reunion of an exceptionally talented, fun, playful, and supportive family. If you haven’t seen Fiona sing “Jolene” with The Watkins, consider adding it to your bucket list. The spirit of friendship, artistry, happiness, musicianship, trust, respect, and love, fills the room as they sing. It’s spectacular. 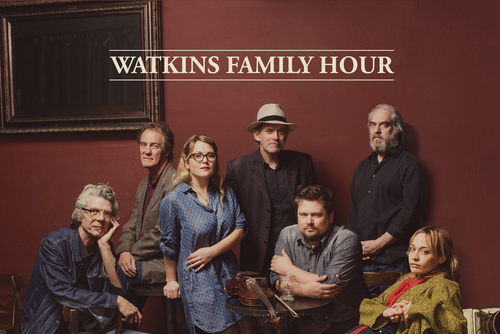 The Watkins Family Hour isn’t so much a “show” as it is a dynamic expression of music and life, in the purest sense. Years ago, at The Fairfax venue, you’d often hear Flanny make a request from a back corner of the room. It was a reminder of how much Flanny loves music and the musicians who play Largo. His respect for and appreciation of musicians, and those who share that respect and appreciation, was – and still is – carried throughout everything that happens at Largo. To this day, Largo is the epitome of what can be when people operate with unwavering integrity and intention. “This one’s at the request of Flanny,” Sara said, introducing the next song. When The Watkins Family Hour concluded in the theatre, a line formed down the block, outside The Little Room for another intimate performance. The Little Room is reminiscent of the Fairfax days – tables and chairs, a bar at the back of the room, and the shouts of audience requests. After a few songs and some more astonishing magic, the evening came to an end, feeling much like it did at the very beginning. A few people were at a loss for words as they expressed their gratitude to Sean, Sara, and the band, after the show. Even as I write this now, it is challenging to articulate what a truly “astonishing” experience The Watkins Family Hour is. Friday night was a celebration of The Watkins Family, which includes enduring friendships, the home known as Largo, and an audience that can’t get enough. This entry was posted in Largo and tagged anniversary, concert, Derek Hughes, Fiona Apple, Glen Phillips, Largo, live music, music, Sara Watkins, Sean Watkins, Toad The Wet Sprocket, Watkins Family. Watkins Family Hour is the perfect show leading up to the holidays. With Thanksgiving rapidly approaching, Sean and Sara Watkins’ sheer talent, along with a healthy dose of murder ballads are welcome reminders of how blessed we are to be alive. Once a month, for a decade now, The Watkins have been bringing their guitars, fiddles, and friends to Largo for what has long been one of my favorite shows in LA. They often share the stage with some other people you may recognize, including Fiona Apple, Dawes, Jackson Browne, Van Dyke Parks, and John C Reilly. Yet, Sean and Sara are the foundation of the show and even if no on else were to join them on stage, they’d still have one of the best shows in town. To play the way these siblings do requires that they actually listen to each other, constantly. It’s as if the universe has simultaneously presented them with a brilliant gift and ever-present joke – you’ll make great music together, but you have to get along. Perhaps that’s why the only detectable sibling rivalry seems to stem from their sense of humor. The murder ballads are balanced by Sean and Sara one-upping each other with witty observations. Their snarky sense of humor showdowns are a testament to how much they respect each other, as family, as musicians, as friends. Eventually, one of them acquiesces, “Ok, that was good!” and they jump into the next song. The Watkins Family band is unparalleled: Benmont Tench on piano, Sebastian Steinberg on bass, Don Heffington on drums, and Greg Leisz on steel pedal guitar. It’s worth attending this show monthly, for the musicianship and camaraderie alone. Throw in a lot of laughs, some special guests, frequent surprises (dancing bears and such), and the perfect venue, The Watkins Family Hour is an exceptionally worthwhile way to spend an evening. Last night’s show was no exception. Although I attend The Watkins Family Hour monthly, I’m always moved – as if I’m experiencing it for the first time – by how uplifting The Watkins’ shows are. The shows vary significantly from month to month, but some things are consistent: beautiful voices, blended with remarkable musicianship and laughter. The next Watkins Family Hour takes place on December 19th at Largo. Sadly, it’s the one show this year I have to miss. Luckily for you, that means there will be a couple extra tickets available. I highly recommend you get tickets in advance and round out 2012 with what is sure to be an amazing and memorable evening. For those of you not in LA – and those of you in LA who would like to re-live some of the shows – there are 7 free podcasts of The Watkins Family Hour at iTunes. Episode 7, recorded on an iPhone due to a power outage, is the show I wrote about here. It remains among my favorite lifetime experiences to date. Thank you for another wonderful year, Watkins Family. I’m still campaigning to have a “Season Tickets” package available for purchase. This entry was posted in Largo and tagged Benmont Tench, concert, Dawes, Don Heffington, Fiona Apple, Greg Leisz, Jackson Browne, John C Reilly, Largo, live music, music, Nickel Creek, Podcast, Sara Watkins, Sean Watkins, Sebastian Steinberg, The Watkins Family Hour, Van Dyke Parks.